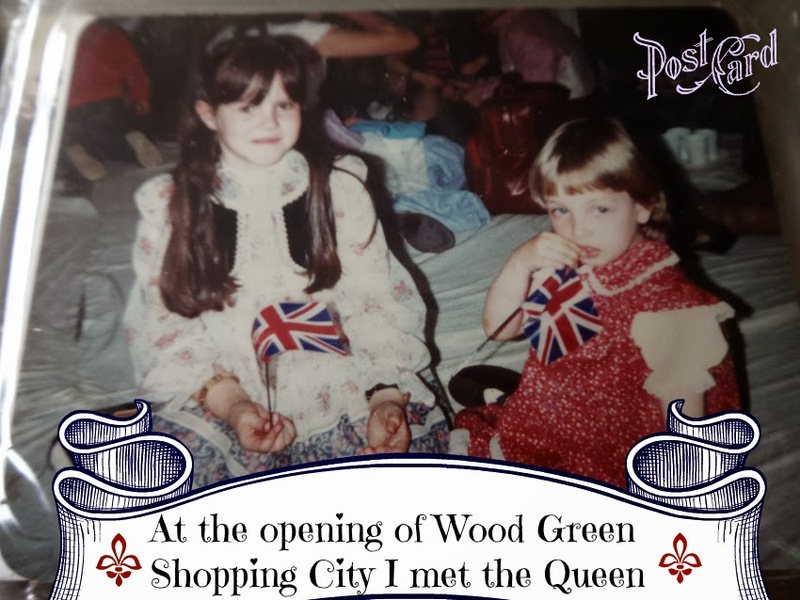 I am feeling nostalgic and reflecting back to when I went to the opening of Wood Green Shopping City, a place I spent a great deal of time growing up. I have been meaning to post these photos on my blog for years, but I finally got the nudge I needed as the theme at Sticky Fingers Photo Gallery this week is Rewind. which means I was 8 years old in those photos. Apologies for the quality but they are photos of photos as I can't get my scanner to work. Back then we were not swamped with Westfields everywhere. Back then, the opening of a Shopping Centre was a really big deal. In my childhood the only ones I knew of were Wood Green and Brent Cross. As it says on the site linked to above, it took 20 years to build at a cost of 50 million GBP. No mean feat! Now, are you yet asking how I came to be inside, so close to the Queen? (I didn't technically meet her, that is a bit of poetic (bloggers') license there!) Well, one of the prestigious retailers in there was none other than C&A. They were the Primark of the 1980s, except everyone went there (or at least in my little world they did). Let me shout out some labels to jog your memory. Canda was the old lady label: you know the elasticated waisted trousers, and the pastel coloured t-shirts and Granny-fied jumpers. Nobody seemed to realise that Canda was actually C-and-A. See, taught you something there didn't I!!!! Jessica was for the discerning lady. Perhaps already a Mother, but still young enough to care how she looks. (I make this comment, because back then, people seemed to dress in a Mumsie way the minute they had kids - I know it is no longer like that (*coughs* looking at the state of myself whilst typing this) but it seemed to be common back then to adopt a pair of Scholls and forget your age. What did I wear throughout my teens, and when I was 8, 9, 10, 11 and 12. I wore Clockhouse. Clockhouse ALL THE WAY girlfriend! It meant I was in ra-ra skirts and leg warmers, and always sporting the latest fashions. People often wondered how I did it, with me being in a one-parent family, but (1) I was an only child (2) my Mum was working (she had to when she and my Dad split up) and (3) she got amazing bargains as she worked there!!!! Every week (sometimes every day) she came home with something - be it little or small. They were recruited long before the Shopping City opened and had lots of training prior to the opening. I often got to go behind the scenes as a child and it was a slick operation, cutting edge in retail. It was such a family friendly business; I went on lots of day trips. We even did our own version of It's a Knock Out at New River Sports Centre. Now THAT was a LOT of fun. Speaking of New River, that was another one of my stomping grounds, where I regularly "met" Seb Coe and Daley Thompson (the latter was very grumpy - at least when I would see him). Seb Coe accompanied us on the Coach when we did the London Mini Marathon. I did that 3 times and had the honour of participating in the first one! I am really going to make you sick now, as this is so stereotypical.... what did I do the minute I was old enough to get a job........ yep I went and worked there myself. This was a VERY sensible thing to do as they paid the best rate of pay for Sales Assistants on the High Street. I was there for over two years, and when I started I was on over 5 pounds an hour and by the time I left I was on over 6 pounds an hour. Now bearing in mind this was from 1989 to 1992, you can understand WHAT a good wage that was, considering what the national minimum wage is a massive 22 years later. THIS is one of the reasons I am so passionate about how lowly paid people are now. We have seen the price of EVERYTHING go up, apart from labour. Yes the Executives get pay rises in double figures but everyone else is on a pay freeze. I don't know about you, but from the minute Lehman Brothers went bust in 2008, my employer introduced a pay freeze that was still standing when I got made redundant in 2012. I wasn't sure I believed my Mum when she once told me you had to be Catholic to work there (we are) but I have just found the proof of it. Again, Mother's always right! Secrecy seemed to insulate the company from change and criticism of other policies that appeared anachronistic. The company's paternalism and preference for hiring Catholics attracted particular criticism from the media. Recruits were required to be devout Catholics and attend mass. The rest of the week was devoted to work training and study for compulsory examinations. If managers became engaged, they were required to give the company details on the betrothed's parents and religion. Non-Catholic affianced partners were expected to convert or, in accordance with the Catholic Church's teachings, to at least agree to a Catholic ceremony and Catholic religious education for the couple's children. The company's governing board and top management positions remained dominated by members of the Brenninkmeijer family and those related to them through marriage. Down the years, I had always said Clement and Augustus (I was nearly right)! So, that's all for now, unless you have any questions? Actually the plot that C&A was on is a little jinxed. After it was C&A, it was Woolworths (like C&A it was on both floors). Both strong retailers on UK high streets. Both much loved by the average Joe, and both gone (yes I know, Woolworths is still available online and C&A is still across Europe but you get my drift). Really interesting post, Liska, and some great photos there! My grandmother worked at a library book suppliers and she had LOADS of "seconds" to bring home with her so every time we visited I knew I was going to get a new book - this totally fulfilled my love for reading. Ah I love old photos - I have some of Prince Charles at Gloucester Docks from when I was little and I love the jaunty angles I took them at - back before digital cameras and online editing! What lovely photos to look back on. 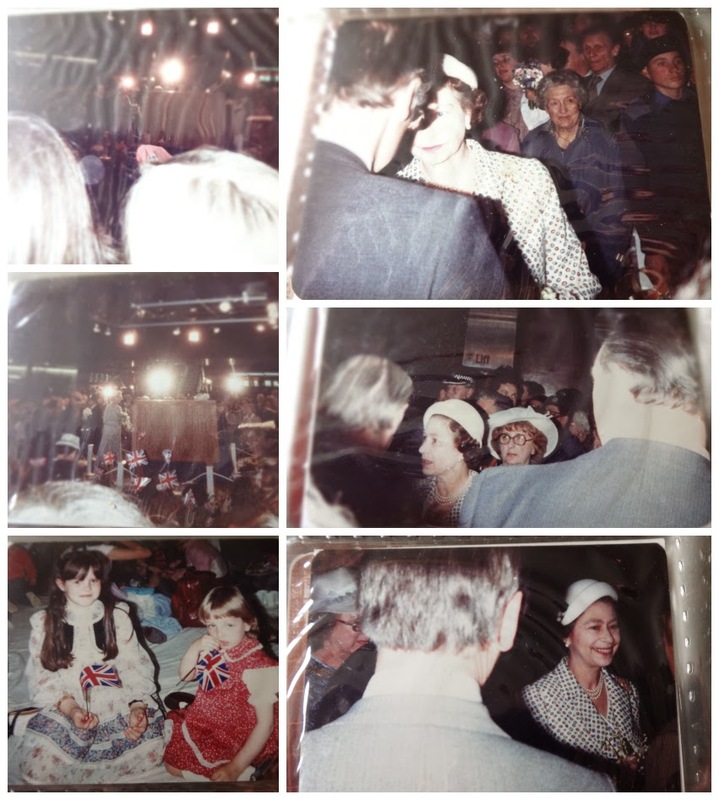 I remember when a shopping centre opened near us but the Queen certainly didn't attend! Lovely pictures and some fab memories. I remember C&A in our local town - it's a Next now! What a fabulously nostalgic post! Being more or less the same age as you, I remember C&A well. It dominated Bristol's shopping centre and everybody owned something from there! Wow, what a lovely memories! Your old photos look fantastic. I met her husband in 1990! I def remember C&A. Do you really think we are so low paid now? My son earns over £8 an hour and we worked out that I had a "good" job when I was his age and that was only £2 an hour and I did full time hours! What great photos! I used to love shopping in C&A with my sister, I used to borrow all her clothes! Love your story Liska at the same time I worked at BHS as Saturday job they would only employ us in 4 hour shifts so they did n't have to pay us for a break!!! Thank you for a trip down memory lane - I too remember C&A and just love the photographs from the 80's too! Brill pics!! I always thought C&A stood for Clockhouse and Avante - no idea who told me that but now I know what it really stands for. I remember C&A well! In fact I still call the little square in the centre of my home town 'C&A square' even though it hasn't been there for so long that the tweens who hang around there now probably weren't even born when it shut!